After the election I did mourn.Truly. Eternal optimist that I am, I kept focusing on the positive where I could find it. Collaborating. Planning. Staying involved. And held on to the deepest, tiniest, most secret little hope that if I just kept my cool, the lid was going to blow off of this whole thing before January 20th ever got here. We'd be saying, "See? There was nothing to worry about at all!" But the reasons to worry have only gotten worse and this thing is really happening today, isn't it? A little crying does provide a good cathartic release, but not much else. 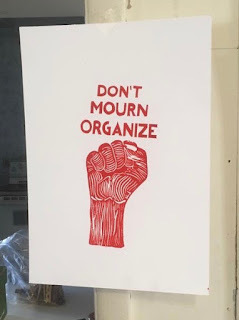 So then it's time to look around at all the organizing happening around me, some that I'm directly responsible for, some that I'm just witnessing and supporting. 2. My social justice theatre troupe, The Meta Theatre Company, has been growing and collaborating so much. We're doing a lot of new and exciting things that I'm really proud of, like helping audiences with bystander intervention training. Ever witness something really racist happen and do nothing? Or do something but wish you handled it different? We're acting out real-life scenarios, discussing the results with the audience, getting their suggestions and even putting them into the scene to try it out. What's been really interesting to me is the plans that sound okay when you talk about them but then fail when they're acted out. Which leads me to believe that our model is very valuable and that we all need to practice, practice, practice so that when we're put on the spot we've got a wealth of knowledge at our fingertips with which to respond. 3. 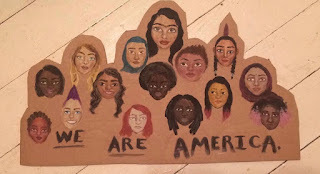 My oldest daughter, age 16, figured out a Mom-approved last minute plan to get to Washington, DC to march this weekend. 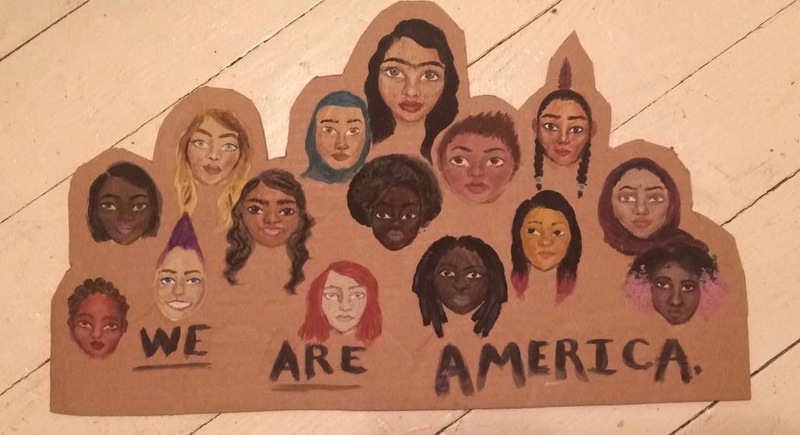 She also painted an amazing sign to bring with her. 4. MLK Day is over but the organizing is not. Now it's time to really start planning the One Billion Rising poster contest and flash mob! * Screw it. I'm reclaiming all the words I want to reclaim from he who must not be named.